It took a move in weight for former UFC welterweight champion Johny Hendricks to get back on track following a three-fight skid. But he managed to do it. “Bigg Rigg” made his middleweight debut against Hector Lombard, a fellow ex-welterweight, in the co-main event of UFC Fight Night 105, which took place live from Scotiabank Centre in Halifax, Nova Scotia on Sunday evening. 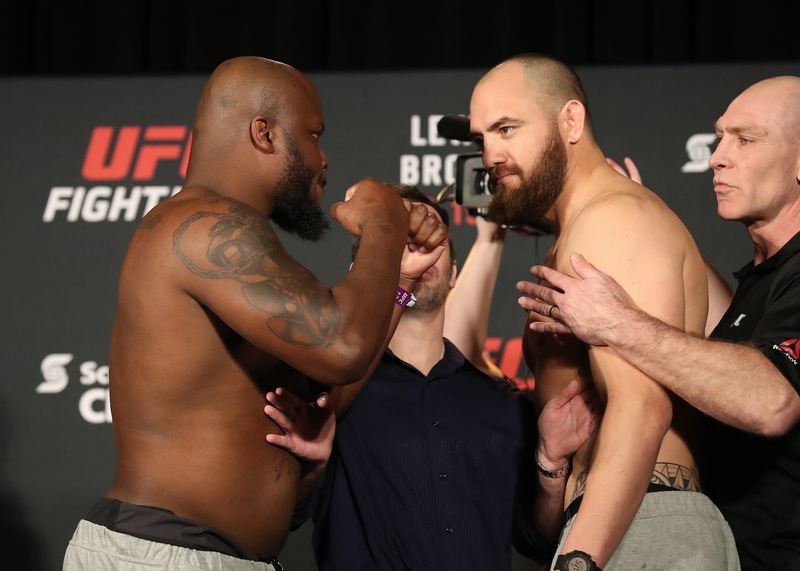 Hendricks vs. Lombard was overall a very close contest; Lombard appeared to have a slight power advantage and landed some heavy shots throughout the bout, but Hendricks was more consistent. Lombard, to no one’s surprise, slowed down as time went on. That said, his cardio held up fairly well, better than other times, but not just as well as Hendricks’. The ex-titleholder also was light on his feet and used lots of movement, which gave him an advantage. He was able to avoid much of Lombard’s offense because of this. His knees were especially crisp, and he looked closer to the Hendricks who won the 170-pound title in 2014 — he’s still pretty far away from full form, but he’s definitely made a step forward even since his last fight (most likely because he’s not cutting an extra 15 pounds!). What was the highlight of the fight? Hendricks vs. Lombard was completely contested on the feet, and there wasn’t a knockout, so the highlight of the fight has to go to the most significant strike(s). And that would be Lombard’s round-one low blow ... just kidding. In all seriousness, Hendricks’ knees in the second round were pretty devastating. He actually scored quite a bit of solid clinch work, including some dirty boxing, so that was interesting to see. I’ll say Hendricks’ knees were the highlight of the fight, though I wouldn’t argue if someone had a different choice. Where do these two go from here? Hendricks has recently talked about retirement, most notably before his fight with Neil Magny, which he would lose by decision in December. But it doesn’t look like that’s the plan anymore, now that he’s back into the winning column in a different weight class, one he seems to be a lot happier in. I don’t think Hendricks can hang with the best fighters 185 pounds has to offer, but he’ll just go up from here. I wouldn’t mind seeing him against a top 10 opponent next. Lombard has now lost three straight and is probably headed back to Bellator MMA. If this was the last fight on his contract it’s probably a given, and if it wasn’t, he’ll still probably find a pink slip headed his way in the near future. I guess I won’t be shocked if the UFC keeps him around for one more fight, considering he’s fought top competition — the aforementioned Magny, Dan Henderson and Hendricks — but if I had to put money on it, I’d say we’ll see him in a different organization next time out. Watch now, later, or never? Hendricks vs. Lombard was slow at the beginning, but its pace picked up as time went on. I’d check this fight out sooner than later.